Al Qaeda has risen itself in Syria for nearly 3 years because it has a 7 nation axis standing behind it - not "Twitter donations." US “officials” claim combined treasuries of US, UK, France, Turkey, Saudi Arabia, Qatar, Israel, and others no match for “Twitter donations” in latest and most absurd attempt yet to cover up direct support for Al Qaeda in Syria. In the latest, and perhaps most absurd attempt yet by the West to cover up direct aid, arms, and funding it has been sending to Al Qaeda throughout the duration of the Syrian conflict, the Washington Post now claims “Twitter donations” have somehow managed to outpace the collective resources of a 7 nation-plus axis who it claims is only backing “moderate” fighters in Syria. 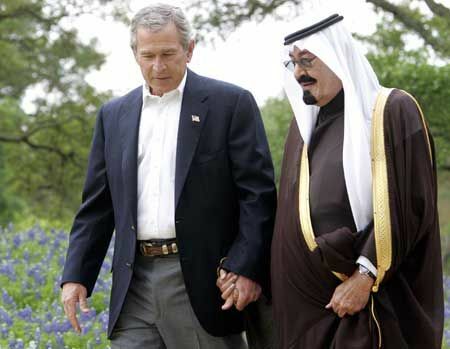 Image: Former-US President George Bush and King for Life of Saudi Arabia, Abdullah bin Abdulaziz al Saud:”The loving parents of Al Qaeda.” From the 1980’s to present day, the US and Saudi Arabia have funded, armed, and directed Al Qaeda while performing propaganda campaigns to bend public perception regarding the terrorist organization – portraying them as heroes, then villains, and back again. The “War on Terror” is a fraud. The stream of U.S. weapons heading to moderate rebel groups in Syria is being offset by a fresh torrent of cash for Islamist extremists, much of it from small networks of Arab donors who see the Syrian conflict as a step toward a broader Islamist uprising across the region, U.S. and Middle Eastern officials say. The private donors, who use Twitter and other social media to collect millions of dollars from sympathetic Muslims, are providing crucial backing for Islamist militias that appear to be gaining ground in northern and eastern Syria, even as fighting stalls elsewhere, the officials said. Of course, all of these networks the Washington Post claims are undermining Western efforts to bolster its army of fictitious “moderates” run through Western allied nations, including most predominantly NATO-member Turkey whose borders and the arms flowing through them are admittedly monitored and steered by the US Central Intelligence Agency (CIA). While radical groups such as the Islamic State of Iraq and the Levant, Jabhat al-Nusra and Ahrar al-Sham have long relied on charitable giving from Persian Gulf states, the flow of private cash has enabled the extremists to retain their battlefield edge despite the loss of support from key Arab backers such as Qatar, which cut off aid to the most radical groups under pressure from the United States and Saudi Arabia, U.S. and Middle Eastern officials said. The extends to which the Washington Post article strains credibility indicate an urgent desperation to bury nearly 3 years of intentional and direct aid the West has sent to Al Qaeda in Syria and documented plans by the West stretching back as far as 2007 to intentional trigger a sectarian bloodbath across Lebanon, Syria, and Iran by backing Muslim Brotherhood and Al Qaeda militants. The Washington Post now expects readers and the general public to believe that somehow “Twitter donations” have managed to outpace this unprecedented multinational logistical feat and give Al Qaeda the edge over the West’s nonexistent “moderate” forces.In reality, the Washington Post article, “Private donations give edge to Islamists in Syria, officials say,” is a hamhanded attempt to cover up the successful execution of the very conspiracy uncovered by Seymour Hersh in 2007, and clearly carried out in earnest starting in 2011. Al Qaeda has risen and perpetuated itself in Syria for nearly 3 years only for the fact that it has a 7 nation axis standing behind it – not “Twitter donations.”Perhaps most interesting of all, however, is the description of the “donor network” the Washington Post lays out. This most likely really exists, augmenting already well-documented extremists networks NATO is using against Syria, and is how the West has funneled such extensive torrents of cash and arms into Syria. It constitutes a full-scale proxy invasion that has apparently run aground in recent months and now the West is looking to divestfrom these monsters of their own creation – perhaps even as a pretext to militarily intervene.